Meet Bob Ebendorf: our visiting artist from Santa Fe, New Mexico. 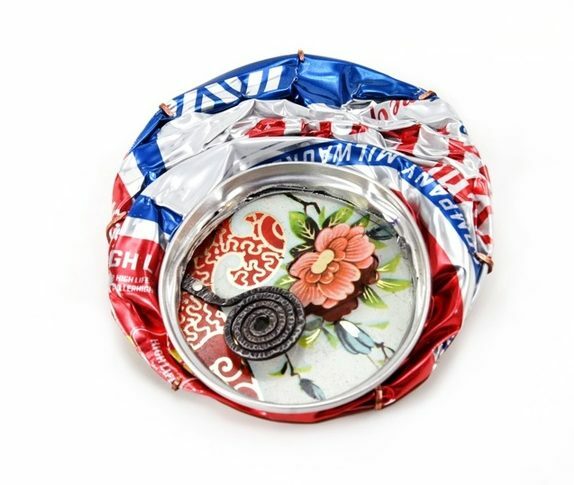 Ebendorf is an American metalsmith and a jeweler, who makes one-of-a-kind jewelry incorporating found objects. 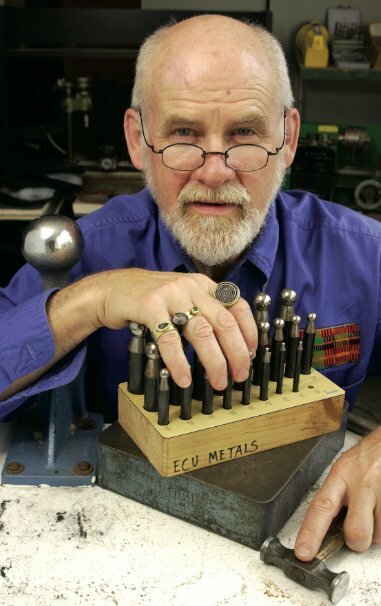 Ebendorf has received numerous awards and recognition for his artistic achievement, including the Lifetime Achievement Award from the North American Goldsmiths. The Studio is excited to have Ebendorf as one of our visiting artists. He will be teaching the workshop, “The Art of Personal Adornment: Low-Tech Problem Solving“, on May 5 & 6, 2018. This is not your everyday jewelry class! 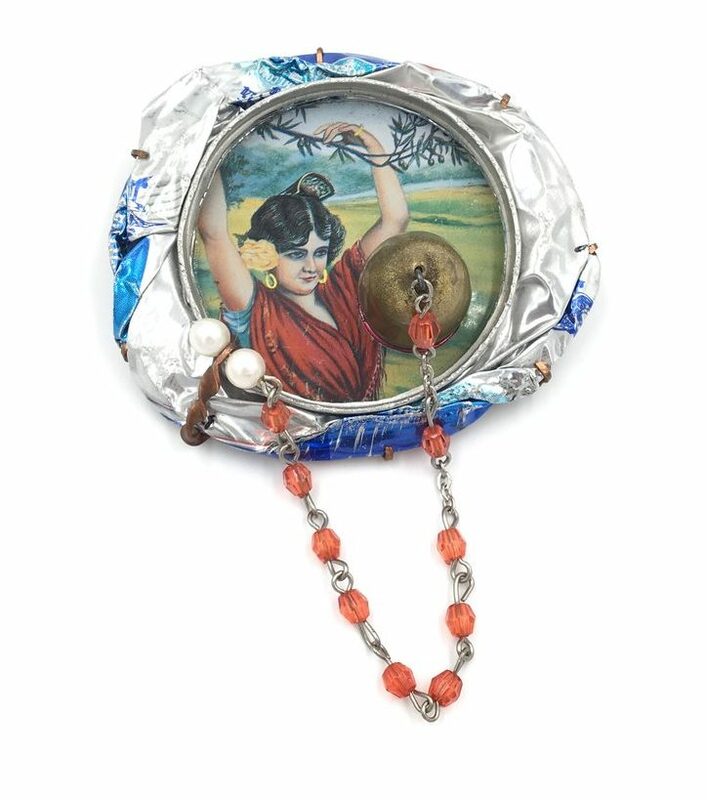 Join Ebendorf in the studio and transform your personal mementos and found objects into works of art. I am from Topeka, Kansas. My father was a medical person and my mother was a housewife. My first sense of learning the beauty of things came from my mother; she taught me the beauty of everyday things; in the fall we would gather leaves and make table decorations. Academics was challenging because of my dyslexia, but I was very good socially and athletically. I received full scholarships in athletics from several universities, but I chose to pursue an education in Art at the University of Kansas instead. I continued in the arts instead of taking my athletic scholarships, which meant I had to work harder to help pay for my schooling, but my family was supportive. The University of Kansas had a strong jewelry department and equipped me to pursue jewelry making as an artist. From then on, I traveled strongly in the arts. I received the Fulbright scholarship after college; It was a humble beginning and for 57 years I have been doing what I love. 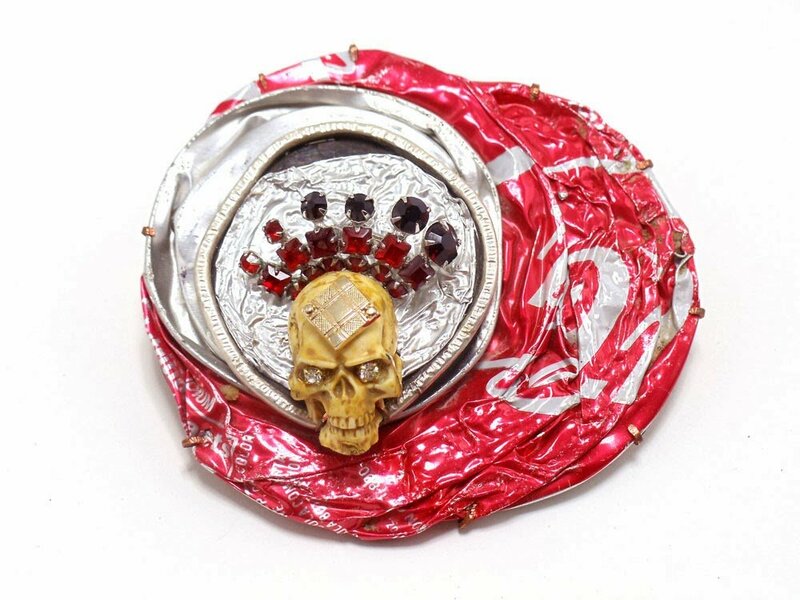 CC: Your work challenges the idea of what Jewelry can be. What is your thought process behind this decision? BE: My work is very radical, but I’m using the same tools and techniques that have been passed down to me from generation to generation. I try to make order out of chaos. Working with lost and found materials that have no intrinsic value, I’m not a person who you would find working in gold and diamond. I started my career using more traditional metal materials, but in the 70’s I began working from the heart and fusing my ideas with techniques I have learned. My work is one of a kind; each piece stands on its own individually. None of my works are alike, but you can tell that they have the same maker because of the way the materials are juxtaposed. Beauty is in the eye of the beholder, what I make may not be seen in jewelry stores, but it’s what I find beautiful. CC: Where do you draw your inspiration from? BE: The inspiration comes from going for walks in the woods, listening to music, and being alone and quiet. These things give me time to think and grasp new ideas. Also, it is very important to me to go to the Museum, that’s where my family is. I may go there and find something made from India, or something made from Africa; they spark new ideas. Museums are very helpful. 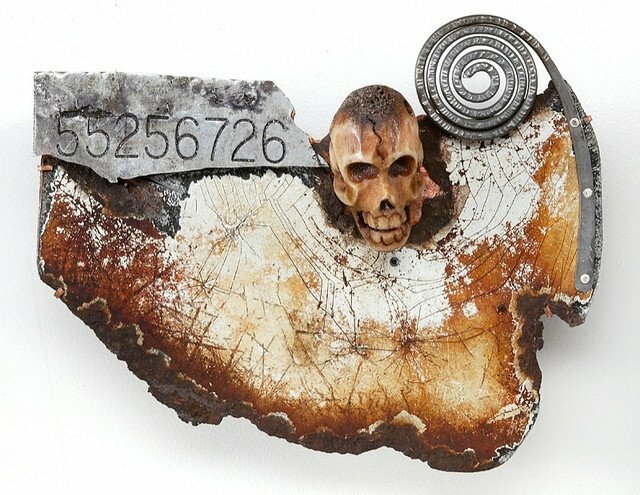 CC: Many of your previous pieces have included objects such as baby doll arms, skulls, bones, fiber, etc. Where do you find the objects that you use for your work? BE: I’m a gleaner; often times I will pick up objects that I find when I am walking in the woods or in town. I am always gathering from the sidewalks, flea markets, or even a dumpster. A lot of the objects that I use are ones that I’ve found while walking and I am always searching for new things to use. BE: I kind of operate on two different levels: If I am invited or want to be apart of an exhibition with a theme, then I will begin to figure out how to incorporate that theme into my work. If there is no theme, and it is free and open to investigation, then I focus on design, color, and juxtaposition. CC: Are some of your pieces influenced by your travel and exposure to other cultures? BE: During my years living in Scandinavia and Norway, the clean, highly polished Scandinavian jewelry had an influence on me. The environments of the places that I have visited have had an influence on me as well; if I go to an Island and I see materials that inspire me on a walk along the beach, I will pick them up to use in my project. CC: What are some of the challenges you have faced in the process of assembling non-traditional items together as one piece of jewelry? BE: Problem Solving is an excitement. If I have an idea, I ask myself: “How do I build or make it? Do I use Solder? Which way could I bring it to life?” So to help me, I call upon the skills that I’ve learned and go back to the ABC’s and fundamentals of metalsmithing. CC: What are some of the advantages you have experienced from being both a teacher and a maker? BE: I have had the richness and opportunity to be an educator, so I still had a paycheck coming in and studio time. I was very fortunate and honored those years as an educator; I taught for 57 years. If I needed to pay rent through the money that I made in jewelry, my work would have been more mainstream and would have had a different voice. Being an educator enabled me to follow my dream/heart, and to make work that I found valuable. CC: How has your work evolved over the years? BE: Earlier on, I was privately hired for commissioned work from companies and churches. It was very design based. I began to lose interest in it and wanted the freedom to make other things. Now at 79 years old, I am very comfortable with the things that I make. Having this freedom and sense of comfort in my making allow me to be playful. CC: What’s the most fulfilling part about being a maker? BE: For me, it’s problem solving, making mistakes, laughing about it, and doing it right the next time. There is a joy to putting things together and connecting with jewelry. I really enjoy being at my workbench, in my own world, in my own zone, and treating myself. CC: What advice would you give to young, aspiring Metalsmiths? BE: For a beginner, I would say that safety is important and don’t be hard on yourself or think that everything has to be perfect. The more mistakes you make the better you will become. To people who has some more experiences and want to pursue jewelry and metalsmithing more, I would say: invest in taking more classes and look for the next opportunity. To college students, I would tell them to go to their teachers and ask them “What else can you teach me?”, “Where can I go to learn more information?” Spend time learning from another teacher and being in another space of learning; it will expose you to new things. Take advantage of what’s available. Go out and meet other makers.